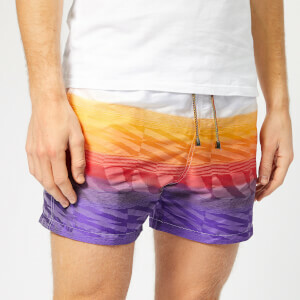 Missoni's 'MARE' collection draws on bold colours and vibrant prints to create striking swimwear pieces. The 'Multi-Stripe' swim shorts are made from lightweight fabric and adorned with contrasting stripes in a blue, green and white colourway. Designed with an elasticated drawstring waistband, integrated mesh briefs for additional support and an appliqué logo badge to the left thigh. 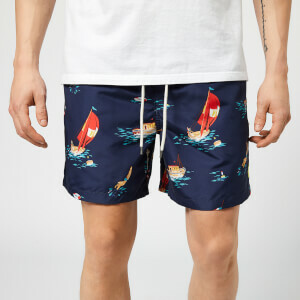 The swimming shorts are finished with two side seam pockets and a single patch pocket to the rear with Velcro fastening and two drainage eyelets. The shorts arrive with a netted drawstring bag in Missoni's iconic zig-zag design.